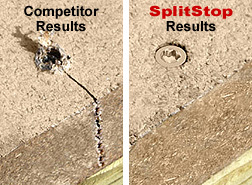 Two unique composite screw choices, specially designed to meet the complex issues surrounding the fastening of varying types of composite (plastic/wood) decking to a wood joist structure. Both feature our ACQ Rated finish, specifically designed to provide enduring rust resistance when used in the new, high copper content, pressure-treated lumbers as well as the Anti-Mushrooming characteristics you look for when fastening composite decking. Splitstop Star Drive Composite Screws are available in three sizes: 1 ½", 2 ½" and 3". Need Help Selecting a Color Coordinating Screw for your Specific Decking Brand? Now you can drive screws into nearly every type of composite decking, regardless of density, without need of a pre-drilling or dimpling function, while eliminating the unsightly mushrooming effect common to many other screws. With the Titan III, you will get excellent head-setting results, with a smaller, less obtrusive head. Experience the best performing composite screw available today. Our new Titan III Star Drive Composite Screw design employs a unique tri-faceted thread/shaft design, barb-type rings under the head of the screw, our recognizable knurled shaft, and a specially designed thread angle - all created to reduce drive torque and pressure within the composite board normally generated by compression. Compression problems plague most of our dual-thread-type competitors' screws. It results in board-end splitting, secondary mushrooming, blow-out, recess drive skipping and spin-out. Complete your projects using any type of wood substrate joist materials. Get closer to the end of a board - without splitting - than ever before. If your composite decking project is being used commercially or on-the-water, choose stainless steel for your project and maintain the Titan, Limited Lifetime Warranty against Corrosion. This heavy-duty, 300 series, stainless steel version of our standard TIII composite screw will provide the ultimate in rust resistance while delivering the same unsurpassed drive experience associated with our TIII ACQ Rated Composite Screws.  Drive Splitstop star drive composite screws into most low to medium density composite decking materials without need of a pre-drilling function.  Eliminate the unsightly mushrooming affect common to many other screws when installed in composite decking - at a value price.  Realize good head-setting results in projects using southern yellow pine joist materials. Designed to perform hidden, “toe-screw”, angled, installation of deck screws, at deck-board edges, with or without the use of a special tunnel-jig* apparatus. *Not Included - Sold by Others Like, Camo, Kreg, etc. Stainless Steel Head-Painted Screws for the installation of Composite Fascia materials specially designed to mount the Fascia in a manner that will prevent, buckling, “oil-canning” and broken screws.  Use the SplitStop Fascia Bit to create an oversized hole and head recess countersink in your fascia material, at the appropriate locations.  Use a drill/driver with torsion adjustment settings to drive the screws. Set the torsion adjustment to stall when fascia screws is flush with the surface. Drive a SplitStop fascia screw into the hole created by the fascia bit. Do NOT overdrive screw.  Place a screw at the upper left corner of the fascia 2” from the top and continue right placing screws, 24” on center, to the end of the fascia board. Repeat this process 2” from the bottom of the fascia board, BUT start the second screw 12” right of the upper screw. This will form a baseball stitch pattern on the fascia as shown below.  Important! Do not over tighten screws.